Originally, the name of a tribe and then of a district of the Edomites. In Biblical genealogy it is the name of the eldest son of Eliphaz, the first-born of Esau, and one of the "dukes" of Edom (Gen. xxxvi. 11, 15, 42; I Chron. i. 36, 53). 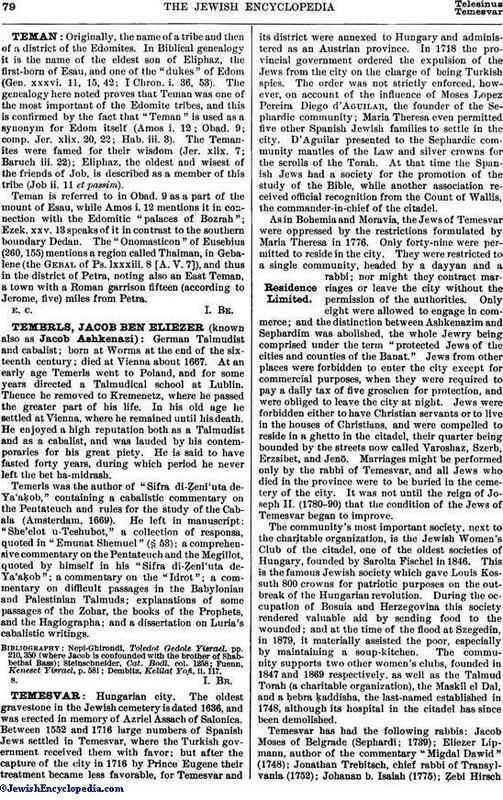 The genealogy here noted proves that Teman was one of the most important of the Edomite tribes, and this is confirmed by the fact that "Teman" is used as a synonym for Edom itself (Amos i. 12; Obad. 9; comp. Jer. xlix. 20, 22; Hab. iii. 3). The Temanites were famed for their wisdom (Jer. xlix. 7; Baruch iii. 22); Eliphaz, the oldest and wisest of the friends of Job, is described as a member of this tribe (Job ii. 11 et passim). Teman is referred to in Obad. 9 as a part of the mount of Esau, while Amos i. 12 mentions it in connection with the Edomitic "palaces of Bozrah"; Ezek. xxv. 13 speaks of it in contrast to the southern boundary Dedan. The "Onomasticon" of Eusebius (260, 155) mentions a region called Thaiman, in Gebalene (the Gebal of Ps. lxxxiii. 8 [A. V. 7]), and thus in the district of Petra, noting also an East Teman, a town with a Roman garrison fifteen (according to Jerome, five) miles from Petra.